Mark your calendar for September 26, 27 and 28! 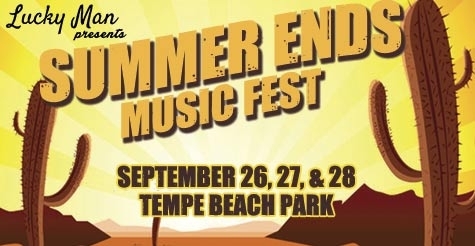 The first annual Summer Ends Music Festival V.1 comes to Tempe Beach Park and promises to be the event of the year. Summer Ends is a three day event featuring top local and national musical artists. In addition to fabulous music, the festival includes food vendors, sponsor booths, arts and crafts. This will be a perfect event for local residents and out-of-state visitors to discover the vibrant arts culture of Arizona. One-day passes start at $65, but you’re in luck! This Ticket Tuesday we are giving away two 1-day passes for the day of your choice to the inaugural Summer Ends Music Festival V.1. Summer Ends Music Festival is a unique blend of arts, culture and good times. Enjoy visual art at the Local Art Gallery. Geek out at the 3D game truck that offers gaming challenges throughout the day. Don’t miss this opportunity to experience a new blockbuster music festival based right here in Arizona. Celebrate the end of summer and join us on the shores of Tempe Beach Park. A long, long time ago when Ska was a huge hit in the valley my favorite band was Kongo Shock. If I had to pick someone now, I’d say the Sugar Thieves! Sergio Mendoza!! Jaime is right. Back in the day, my favorite local band was Chronic Future!! JFA- really put phoenix on the map of a music scene back in the day! The Refreshments- both rocked tempe for years! Currently KONGOS is the band all of AZ should be proud of! Who doesn’t remember Walt Richardson and the Morning Star Band?